Every small business needs that little something that sets them apart from the next guy. Agreed? Otherwise, we wouldn't be very successful. We wouldn't be competition. The key is recognizing that 'something' and then marketing and capitalizing on it to the best of your ability. I caught on real quick when I started my cleaning business what my advantages and selling points were and I still pride myself on them today. The. Cleaning. Diva. That's the first one. The name of my business, and my logo. It's the first impression people get of my business. That's what people are immediately drawn to. Or not. I can't tell you the number of times people have commented on the name of my business. I hear, "The Cleaning Deeeeva...I love that name." Or "your logo is so cute." And I flaunt it. It's on the back window of my SUV, it's on our uniform shirts, hats, sweatshirts, coffee mugs, lunch bags, and water bottles. Logo apparel is a fabulous way to promote your small business. I was shopping in a store at a Jersey Shore town after work one day, wearing my uniform, and a woman read my shirt aloud and said she loved it. Turning to her friend, she said, "We have to get that shirt." Then she asked me where I got it. I laughed, and told her it was the name of my business. 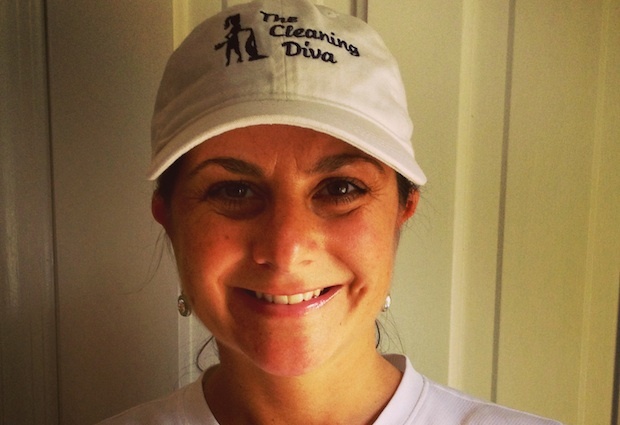 But hey, I'd be happy to have her wear my logo to advertise The Cleaning Diva. Your business name represents you, and you represent it. Make it a good one. My second, and most important, 'something' is relationships. I love to build them, and truly enjoy the ones I have with all of my clients. In fact, many have turned into friends. Relationships have been and always will be the foundation of The Cleaning Diva. I truly care about the people whose houses I clean, and I also care about their homes. I want them to be happy. It's important to take the time to get to know people. Ask questions. Find out their likes and dislikes. Learn about them so you can connect and have significant conversations. It gives validity to you and your business. Especially, in an age where texting and social media have trumped verbal communication. Having strong relationships with my clients keeps them as my clients. It garners trust, and also encourages referrals. Another way I set my self apart is by my meticulous cleaning -- my product, if you will. I mean this when I say, I believe we are the best at what we do. We pay attention to detail. So much that at times my Divas call me Eagle Eye. Lol. I'm always on the lookout for cobweb sightings and handprints on doors, and I refuse to step on carpets after they've been vacuumed -- or I'll have to re-vacuum my footprints. Call me crazy. I set high standards and always take that extra step to make sure clients' needs are being met and that the cleaning we do is as close to perfect as it can get. All fixtures are shined, no crumb or piece of hair is left behind, beds and couch cushions are straightened, pet bowls are cleaned, mirrors are left streak free, and the house smells fresh and clean. Custom requests are always second checked. There are several cleaning services in my area, yet I still have a booked schedule daily. I currently advertise minimally, and the majority of my new clients and potential clients are referred to me by existing ones. My prices aren't cheaper, so I know it's because of my reputation and the super service of The Cleaning Diva.